Thanks for adding this new list, but why does it use American names such as Common Murre etc for what is not an American list? I know the IOC may use these names but do you have to follow? And I have noticed some odd decisions regarding the 'R' category indicating WP rarities. Not been all the way through yet - for some reason entering species one at a time is very slow, much more so than usual - but Blue-cheeked Bee-eater is not a WP rarity (think Morocco, Turkey, Israel etc) but I would suggest Reed Cormorant is. And will the AERC WP list have to change now that the British influence is different? These aren't actually American names as such, these are the IOC's "International English" names. We don't have to follow but we're not an authority ourselves and don't want to be in the business of arbitrarily deciding the best names to use. Having said that, if an international name really isn't in common usage within the region in question (i.e. WP here) then we can easily override it with a more appropriate one. Since there is no official determination of rarity status then we (thanks to Graham Joynt and Chris Bell) have come up with a list we thought appropriate. This is of course subjective, and we can easily make changes. We'd rather add rarities than remove one, because it makes lists more interesting reading when dates and locations are provided. I've made Reed Cormorant a rarity now. I'm not sure if the AERC will maintain their list in the future: we won't make changes unless they do. We can use this thread to suggest any specific changes to species names or rarity statuses. Last edit: 1 year 4 months ago by Mike Prince. The rarity codes are certainly not without fault and were a 'best effort'. As Mike, says they can be changed as we go along, we just wanted to get something up and running. Mike, I forgot to include Double-crested Cormorant, so could you make that an R too? 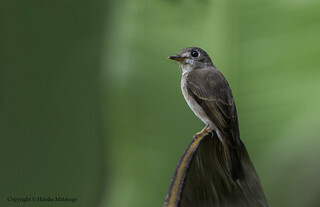 The IOC Western Palearctic list uses a subset of species from the complete world taxonomy maintained by the IOC and which is updated regularly at www.worldbirdnames.org . As from 1 January 2018, this is exactly the same taxonomy used for the official BOU British List. The geographical limits of the Western Palearctic are as defined by the nine-volume Birds of the Western Palearctic - basically Europe, North Africa and a block of the Middle East roughly south and east to Kuwait, but not including Iran nor anywhere east of the Urals and Caspian Sea. For more precise definitions, see BWP. 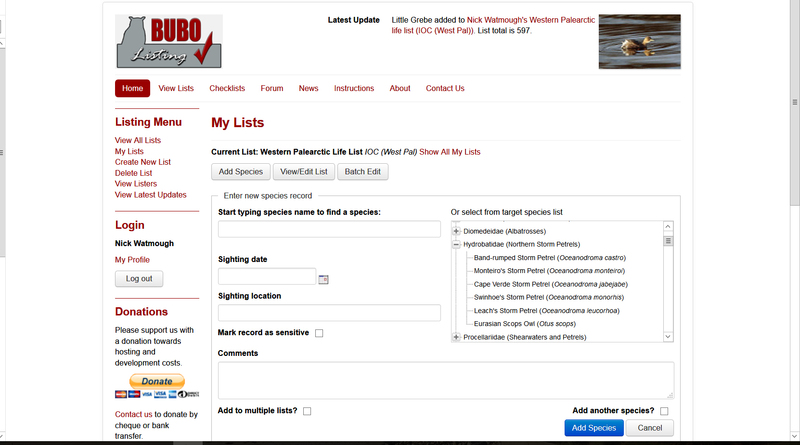 This is the most up to date Western Palearctic list, and is the recommended one to use for Western Palearctic lists on BUBO Listing. Thanks very much Graeme, much appreciated. Many thanks for all those involved in this initiative. Copying my AERC based WP list was very straightforward and the notes as to what needed to manually updated were clear. I did encounter one gremlin - see attached. Something that probably speaks volumes about a rather strange omission on my own WP list! Thanks for the misplaced Scops, now fixed!